Third-party TCP/IP, web browsing, and built-in e-mail. Support for hard drives larger than 4GB. Modern Graphical User Interface (GUI). Click here for an extensive features list. Change of the free disk space display; shows to one decimal place, with "MB" instead of "M", "KB" instead of "K" etc (not sure whether this was introduced in BB1 or BB2). The mish-mash of icons which weren't replaced properly by the installer (datatypes icon for CD0?!). The updating clock icon, which was included on the OS 3.5 CD by mistake. ram 44.21 supports long filenames. I recall mention of "one new feature" in console.device 44.6; no idea what this is, possibly an easter egg. SYS:C/IPrefs has a "God Only Knows" message inside. Olaf Barthel explains that: "God Only Knows" is perhaps the greatest pop song ever written (that is, written by Brian Wilson, performed by the Beach Boys, found on the "Pet Sounds" album). SYS:Prefs/Printer creates a process called "Nicole". Nicole who? Again, Olaf explains: "Nicole is the lovely lady you see pictured in the Printer Prefs preview section. She was the press contact and administrative head at Amiga International until she left last year." Harry Sintonen adds: "LIBS:version.library and LIBS:icon.library seem to have something inside them (not sure what; I asked Olaf Barthel about that stuff). I'll keep you up to date." Position the about window so that both left and top are odd (for example to position x:1 y:1, you can turn off the mouse acceleration to make positioning easier). Type "Who?" when the window is active (excluding the quotes). Check RAM: for something cool. "Do You Know The Way To San José"—message inside the LIBS:workbench.library. There is a relocation entry pointing to this string inside the library, but it doesn't seem to be used by anything. Not 100% sure about this though. And the others are in light. The Boing Bag archives (1 and 2) are unique; i.e. 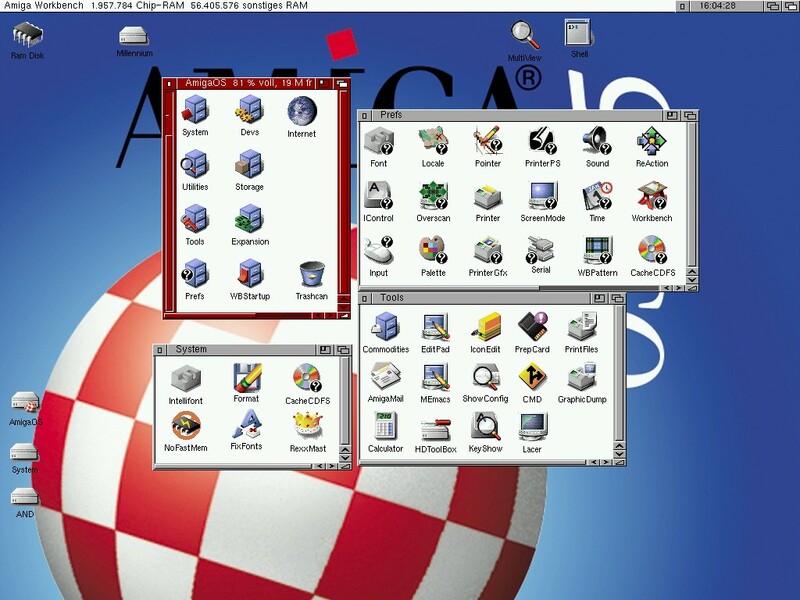 you are required to download and install—separately and in numerical order—both to correctly update your AmigaOS 3.5 installation. Chris Young notes: "The first update to OS 3.5 called "Boing Bag 1" was released on December 24, 1999. This fixed some issues found in the original release, and also added some new features. However, a machine with the updated version of OS 3.5 has exactly the same Workbench version number as a machine without it (v44.2), so the usual method of checking the OS version by looking at version.library is not entirely accurate in this case. Perhaps the easiest way to tell if a machine has been updated is to look for the AnimatedIcon utility. Also, the original OS 3.5 is the only version of Workbench to "list by date" with the oldest files at the top of the list." OS 3.5 has unimplemented context-sensitive help. Chris Young explains: "Pressing the Help key in Workbench attempts to load a file called HELP:english/sys/workbench.guide. However, this file isn't actually distributed with Workbench. If you want to test this, try renaming any AmigaGuide file and moving it to HELP:english/sys. Press Help in Workbench, and the doc will display (a "cannot open node" message will also appear briefly.)" The version of Workbench 3.1 (v40.42) on the OS 3.5 CD is identical to the original Commodore version, with the exception of the inclusion of v43.6 of SetPatch. Interestingly, even the original version command is included (v40.1) instead of the Y2K-fixed version (v40.3), dated 01/04/99. The OS 3.5 FastFileSystem has the version number 45.1, rather than 44.x. Similarly, the new serial.device has version number 43.1 instead of 44.x. OS 3.5 contains the unregistered version of Miami 3.2b as the special OS 3.5 version did not work out. Chris Young notes that the release version of OS 3.5 saw the return of the disk space "fuel gauge", seen in pre-2.0 versions of Workbench. Holger Kruse explains the v44.x version numbering for OS 3.5; posted on comp.sys.amiga.misc (11.13.99): "V43 was used for a lot of things, but AFAIK never quite officially. The main reason why 3.5 is not V43 but V44 is probably to avoid revision number clashes with the various third-party V43 modules, e.g. the V43 datatype API and implementations. What happened is that a lot of third parties tried to extend AmigaOS on their own, once they saw that there was no official development going on any more, and they decided to use V43 because it was the smallest version number guaranteed to be higher than any official OS version number. Now with OS 3.5, Amiga Inc. has to increase the version number once more to officially obsolete those intermediate third-party products, hence V44." OS 3.5 could easily be deemed "the most (or one of the most) controversial OS releases in the Amiga's history."